Room Pressure Monitors Discontinued Product . The DPG700 is no longer available. Please see the DPG409 series as a possible substitute or contact our sales department. 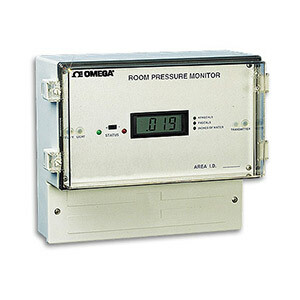 The DPG701 room pressure monitor takes advantage of our time-proven sensor technology to monitor, alarm and/or control critical room-to-room differential pressures. The same instrument monitors either positive or negative room pressures. It is easily mounted on the wall and the installer has the choice of rear or bottom knockouts for electrical and pressure connections. All electrical and mechanical components are housed in a tough polycarbonate NEMA-13 (IEC529, IP65) enclosure with a clear, gasketed cover for easy viewing of display and room status. The room pressure monitor comes standard with a SPDT relay (for supplemental controls such as audible alarm or remote status indication), and 3 analog output signals, 0 to 5 Vdc, 0 to 10 Vdc and 4 to 20 mA. These analog outputs are proportional to the room pressure.